Roxbury’s Reggie Lewis Center hosted the Tri-Valley League’s indoor track meet on Saturday night, February 2. The meet featured teams from Westwood, Dover-Sherborn, Medfield, and their conference opponents. While there were many gifted athletes and innumerable great performances in Roxbury, a few did stand above the rest. 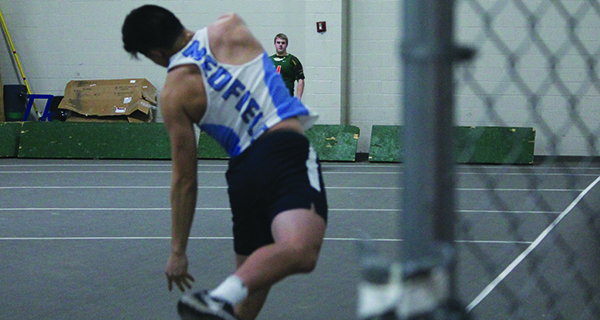 For the Medfield Warriors, the highlight was likely runner Ryan Eng, who won the 55-meter dash (6.75) and set the MHS record in the 55-meter hurdles (7.71). Although his friends were egging him on to say something braggadocious, Eng instead remained humble. Baird should have been happy, particularly with the 40-foot personal record launch from Liam Dullea, who started the year throwing only 32 feet. Captain Will Solomon also had a steady performance, topping out at 34 feet, and Brandon Loughnane also achieved a personal record at the meet, where he placed second overall. Westwood also received strong second-place performances from Dawnesha Dyer-young (girls 55 meter hurdles; 8.80), Jack Deehan (boys 600 meter run; 1:26.35), Zach Conant (boys one mile run; 4:30.94), Jane Krumsiek (girls 600 meter run; 1:42.27), and Sarah Conant (girls 1000 meter run; 3:06.68). The athletes from Dover-Sherborn looked like they were having the most fun, ranging from the 4x200 relay team, who warmed up with some pull-ups on the bleacher railings and told Hometown Weekly they wanted to “run hard and finish strong,” to the high-jumping duo of Danny Bennett and Will Brown, whose highest jumps may have been when they leapt in the air and collided with each other to celebrate a teammate’s success. Oliver Fried, meanwhile, supplied his Raider teammates with plenty to cheer about: a dominant performance in the boys one mile run. Fried took first with a time of 4:28.40, crossing the finish line before Westwood’s Zach Conant. Fried’s teammate, Noah Guarini, finished close behind in fourth with a time of 4:41.19. On a bitterly cold Friday night, the Reggie Lewis Center played host to some top-notch high school athletes. And while the competition was fierce, the camaraderie and friendship on display was just as prominent.